As I have previously mentioned, I have an aversive reaction to the enzymes in fresh pineapple. Namely, I experience a stinging sensation in my mouth and my lips puff up. Not pretty. 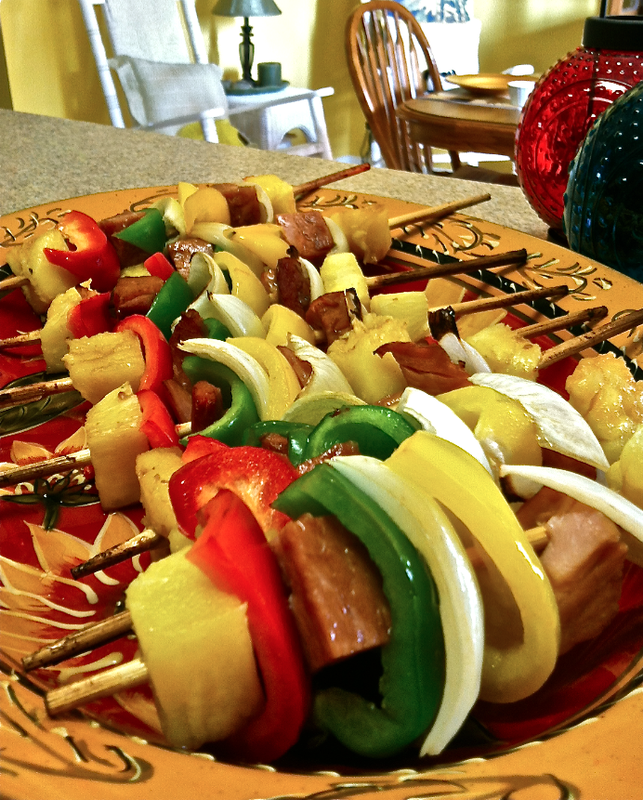 But when cooked, I don’t have the reaction (unless if I chow down an indecent amount of pineapple). And so, when working with pineapple, I usually use the outer sides of the pineapple (less enzymes are concentrated here) or cook it. 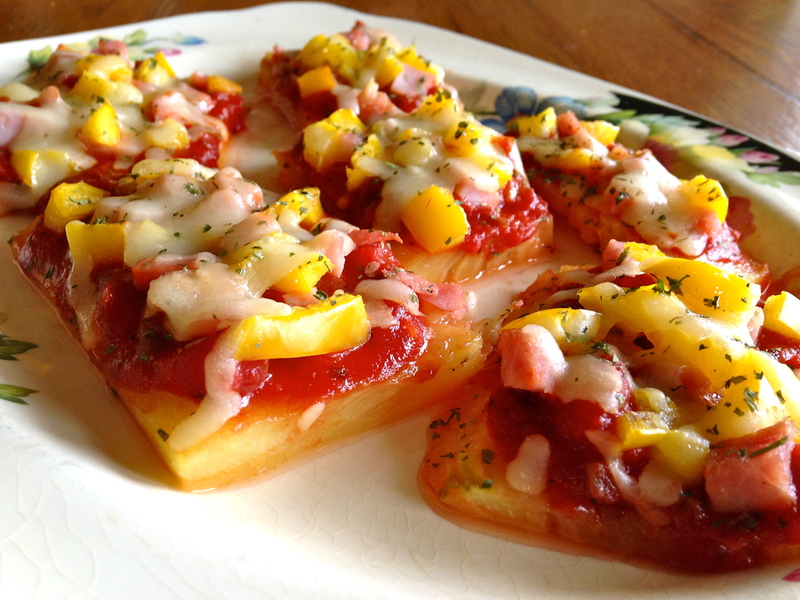 To kick off the unofficial start of summer, I’m posting a Hawaiian Pizza recipe. But instead of topping it with pineapple, I’m using the (cooked) pineapple as the crust! Preheat the oven to 350 degrees. Place pineapple slices on a baking pan and place in the oven for 10 minutes. Take out, spread on a thin layer of sauce, followed by bell pepper, ham, mozzarella, and cilantro. Put back in the oven for 10 more minutes. Let cool for at least another 10 minutes before eating. I have a love-hate relationship with pineapple. On the one hand, it’s pineapple: yummy, refreshing, and bursting with juice. Plus, it makes images of tropical islands pop into my head. On the other hand, I have a bad physical reaction to the enzymes found in fresh pineapple. My mouth begins to burn and my lips puff up 😦 Grrrrr. And the first time I realized I had this reaction? : the night before my first day of school. Lovely, right? But does this deter me from my love of fresh pineapple? Certainly not! I bravely (and yes, I’ll give you stupidly) eat on. Cut cauliflower into florets, place in a food processor, and pulse until cauliflower resembles rice (do not over-blend, or else it will turn to mush!). Set aside. Chop chicken into bite-size pieces. Heat coconut oil over low heat and cook chicken. Add in onion, garlic, ginger, and curry powder and sauté for 5 minutes. Add in red bell pepper and cook for 5 more minutes. Add in pineapple chunks, coconut milk, pineapple juice, and cilantro. 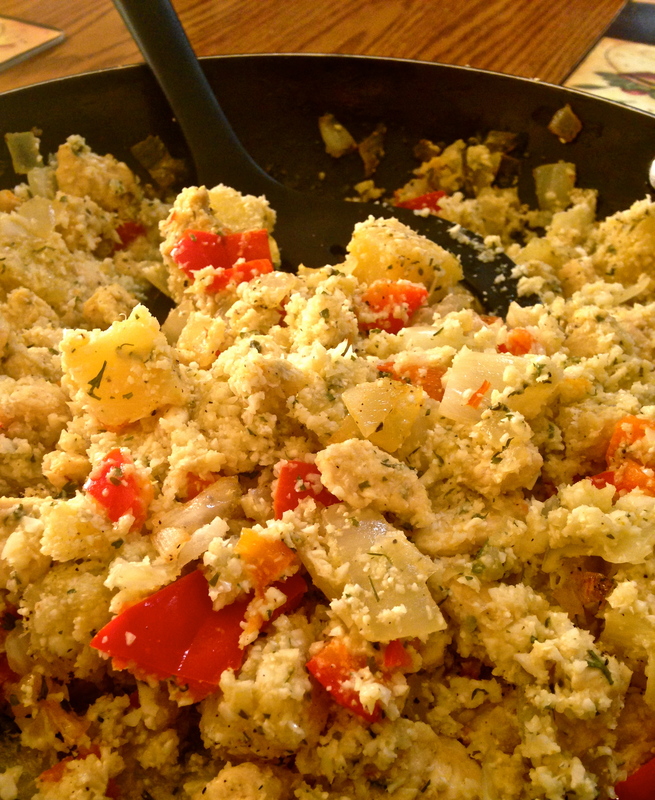 Stir in cauliflower rice, add salt and pepper, to taste, and cook for 10 more minutes. Tuesday night was my last night of freedom. Now it’s back to stress and lack of sleep. The downside of college. Unfortunately, this also means that I won’t have much time to create and cook new recipes. And so, the other night I decided to make something extra special. Awhile back, I saw what is called “pineapple boats” in a magazine. I thought it was such a cute idea with a pretty end result. 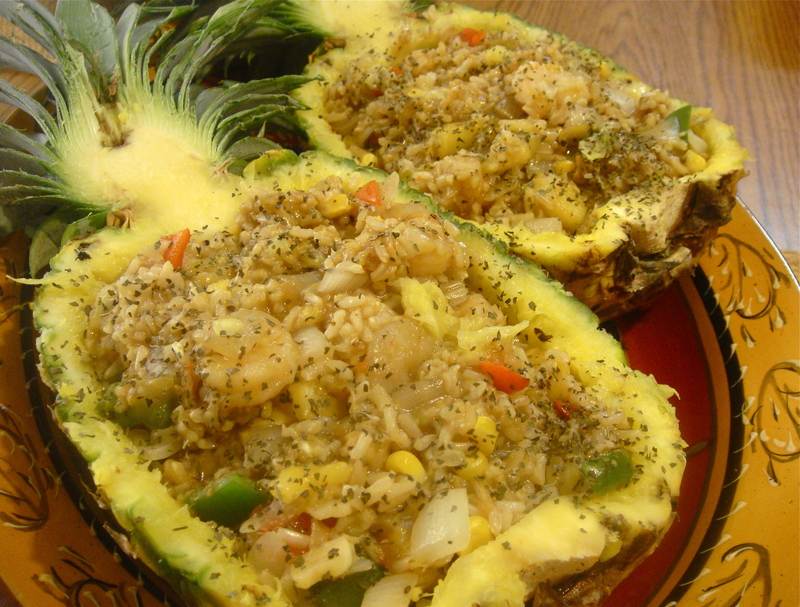 For my send-off meal, I made pineapple boats stuffed with rice, shrimp, and peppers. Not only did it taste delicious, but it also looked oh so very impressive. Cook the brown rice while making the rest of the meal (it’s ok to make the rice in advance). Cut the pineapple in half and hollow out the insides, reserving the hollowed pineapple, the pineapple meat and juices for later. In a deep skillet, heat the coconut oil and add in the shrimp. On low heat, cook for 2 minutes. Add in garlic cloves, onions, and peppers. Let cook for 5 minutes, stirring every so often. 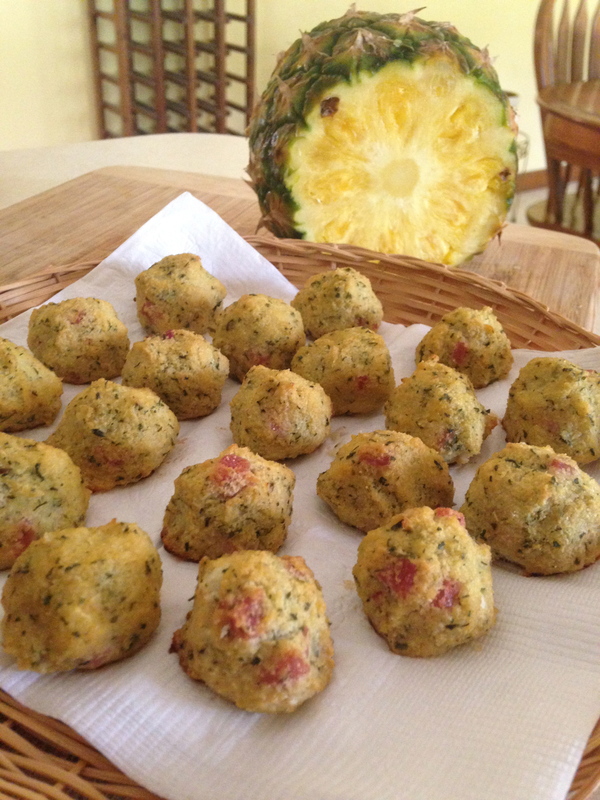 While this is cooking, cube pineapple meat to the desired size. After the 5 minutes, add in 1 cup of pineapple chucks, 2 tbsp of pineapple juices, and the corn. Let cook for 3 more minutes. Add and mix in brown rice. Stir in soy sauce, hot sauce, red pepper flakes, and basil. Transfer the rice mixture into the hollowed pineapple bowls. With a spoon, top with more pineapple juice. Garnish with basil.